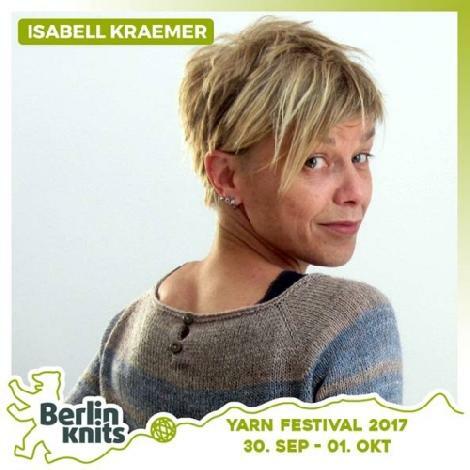 Isabell Krämer - Workshops | Berlinknits - Yarn Festival 2017 - 30.9. - 1.10. Isabell creates everyday items for modern knitters. Loving the outdoors, she is heavily influenced by nature; and those who know her designs love her casual, contemporary pieces that all come with a little twist. A confessed stripe addict herself, she is also hooked on seamless construction; not because she doesn't like seaming (she is a fully qualified dressmaker after all), but because she loves to see garments take shape and being able to adjust the fit on the go. Although hugely successful as a knitwear designer, she says that the biggest accomplishment is her son (there is even a pullover named after him) - becoming a mother was the best thing that has happened to her, followed a close second by her husband of a few years and her three cats.